Neo-angle showers from GlassWorks add character to your bathroom. They also save space in compact bathroom layouts. They look fresh and elegant while using space in a smart and efficient way. GlassWorks is an industry leader in the complex process of designing, engineering and installing neo-angle glass shower doors. What are Neo-Angle Glass Shower Doors? Neo-angle shower doors are generally a diamond shape. With two long sides along the bathroom walls and three other shorter sides that include the door. Most often this shower enclosure design is used when bathroom space is tight. Although the diamond like shape is typical, neo-angle shower designs can vary quite a bit. 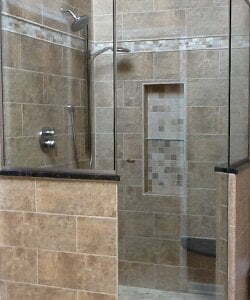 Each shower enclosure that GlassWorks designs and installs is unique and beautiful. 3/8” or ½” thick Glass – Giving you the substantial feel and support necessary for your shower enclosure. Sand Blasted, Acid Etched or Laminated Glass – Provide unlimited custom patterns and degrees of privacy. All the hardware GlassWorks supplies is engineered and specifically designed to be used in our showers. Our size allows us to be the leading expert in shower door designs and give you the most options in shower design, functionality and form.